Blocking works well against these mid-sized Heartless to stop their various kick attacks and create an opening. You can also nullify their attacks and trip them up by hitting them with a combo finisher when they start kicking. The Sergeant is an Emblem Heartless that appears in Kingdom Hearts 358/2 Days. The Sergeant is a large, humanoid Heartless with black skin. It has large hands with yellow claws, and it wears tattered, black boots with curled toes. It also wears silver bracelets and white knee guards. Its glowing, yellow eyes are visible underneath its white helmet, which is decorated with two angular, black spirals, and a curled antenna on top. The Heartless emblem is emblazoned on the Sergeant's chest. "Sergeant" is a military term that refers to the highest rank a non-commissioned officer can hold in most non-naval military forces. This reflects the Sergeant's large size and great strength in comparison to its other variants. The Sergeant is not difficult to defeat; its large size makes it easy to hit. 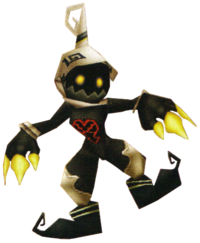 This Heartless should not be attacked repeatedly, however, as it will counter after a while with a powerful kick. This is the only attack in the Sergeant's arsenal. This page was last edited on 4 February 2019, at 20:57.